Whenever I’m bored and feel like I have nothing to say, I go through my old files and pull some old images. Here’s a strange piece of politicial artwork I made back in the days of the first Gulf War. When I made this image, nobody understood it. I guess you had to know the backstory. I hate explaining my work, but I guess I have to. George H.W. Bush was infamous for a saying he hated broccoli. 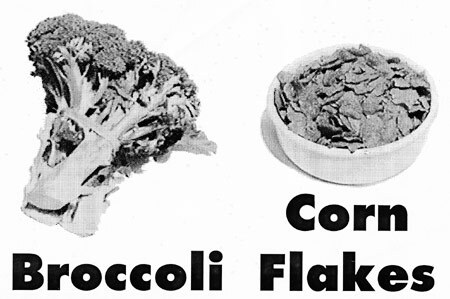 In one amusing incident, Bush spoke at a college commencement and the students all wore corsages of broccoli. About that same time, Iraq took some British hostages, and released a video with Saddam Hussein showing how he made sure they had humane treatment. A young boy is shown sitting at a breakfast table with a big box of Kellogg’s Corn Flakes, and Saddam asks if he’s getting enough milk with his corn flakes. Apparently Saddam thought it would be great propaganda if he showed the British hostage kid eating something that was rare and extremely expensive in Iraq, imported corn flakes with real milk. It’s a bit odd, but something’s popped up on your index page here that crashes out Opera browser without fail. I initially thought it was that broccoli image but the crashing happens even without images. Sorry about that. I’m struggling with reworking the main MT stylesheet, it’s not really documented anywhere so it’s really easy to screw up. I ran my main page through an HTML validator and I was appalled at the results. The majority of errors were in the default templates, not my reconfiguration. I’ll work on it some more, but I have a hard enough time getting MT to do what I want, let alone repairing broken MT internals..